Amazing Race 22, "Loose Lips Sink Ships"
When did taking the penalty become so common on The Amazing Race? Two episodes into this season, players seem very interested in avoiding tasks. Idries and Jamil barely slip into the water and they’re ready to take a six-hour penalty. Their fear of water and limited swimming abilities make diving for pearls nearly impossible. While their struggles are understandable, they seem far too willing to give up right away. They eventually give the Detour a shot, but it’s their passive approach that raises warning signs. By the time they switch to the other option, the gap is too large. Apparently, picking them to win the race was not a wise idea. They’re hardly the only players who struggle, however. Three teams took a penalty last week, and several others grumble through this leg. Wynona can’t run and doesn’t seem capable of going far into this game. Even some physically strong players aren’t looking solid. Is this the least impressive group in the show’s history? It’s too early to tell if the initial problems are just hiccups at the start of a more intense competition. Luck also plays a role in the unpredictable results. Dave and Connor are one of the fastest pairs, yet they may be destined for elimination next week. While running to the Pit Stop, Dave apparently ruptures his Achilles tendon. This isn’t the type of injury that goes away in a short time. 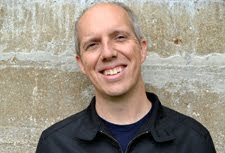 They finish second and are in a good spot, but it may not matter if Dave can’t continue. On the positive side, Anthony and Bates and Jessica and John maintain their leading spots at the front of the pack. The hockey players seem unfazed by the challenges and casually roll into first place. On the other hand, the young couple spends their time obsessing over the Express Pass and what to do with it. The editors are really trying to push the drama behind this decision, but it doesn’t seem like a big deal. Jessica and John are having fun talking about their unspoken alliance. On this show, that bond probably won’t make a huge difference in the outcome. The twins’ exit is surprising because of the main pack’s significant edge over the trailing two teams. Even with a bunching at the start, they still have a nearly two-hour lead. That gap quickly disappears at the season’s first Detour, which gives the choice between “Pick a Pearl” and “Take a Trunk”. Once again, the gorgeous waters of Bora Bora are used to full effect. 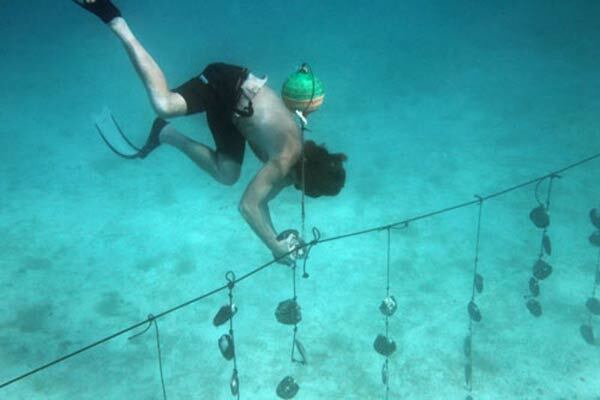 The first option involves diving in the open water to retrieve a group of shells. It’s a “needle in a haystack” task but with the physical component of swimming to grab them. The weak swimmers are going to have a rough time, especially if they’re afraid of the ocean. Pam and Winnie have similar difficulties but hang in there and finish well ahead of the twins. 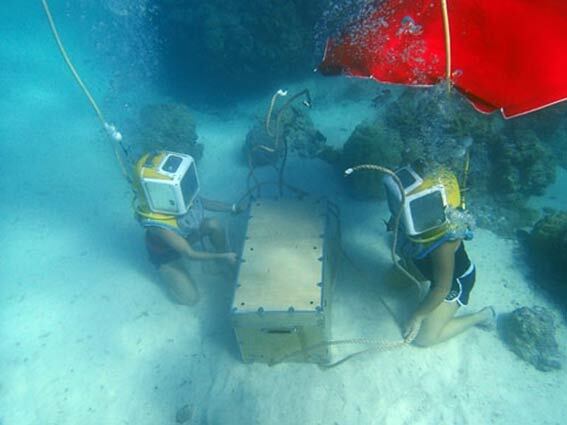 “Take a Trunk” is a silly challenge where teams don a large helmet and set up an underwater picnic. Phil even has some fun describing the task from the ocean floor. It requires less skill but moves slowly because of the burdensome headgear. That helmet is impressive and seems like a good option for visitors who don’t like scuba diving. Max and Katie and Caroline and Jen both take this route when battling at the back of the pack. They say a lot about the rivalry that’s building, but it ends up being a moot point. After finishing the Detour, teams board a personal watercraft and speed to the island of Motu Tapu. After letting out a big “woo!”, they locate the spot and prepare for the Roadblock. The exception is Pam and Winnie, who blaze off in the wrong direction without reading the map. This is not wise. The Roadblock is a deceptively challenging Polynesian game that happens on stilts. 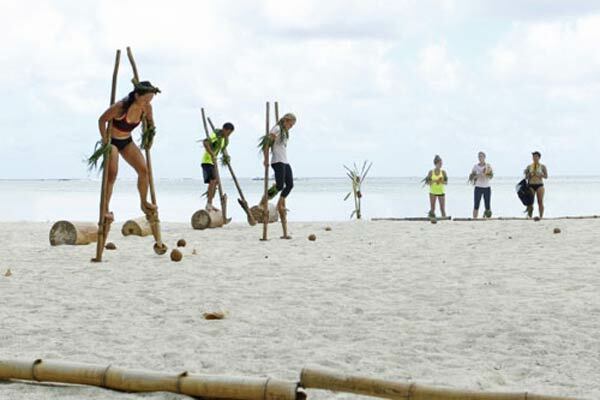 The players must kick a coconut across a beach while staying balanced. Most struggle to find the rhythm, especially Pam while trying to keep them ahead. Once they finish, the next step is locating Phil and a ridiculously attractive greeter somewhere on the island. YouTube hosts Joey and Meghan sprint past Chuck and Wynonna to grab fourth, and the roller derby moms glide into sixth well ahead of the trailing group. This episode again pushes the racers to their limits, but it’s frustrating because so many have problems with straightforward activities. It’s one thing to struggle while diving repeatedly below the surface, but getting out of the boat should be easy. Players with major fears are cast to set them up to overcome them, but sending them to Bora Bora with almost no swimming skills is problematic. The saving grace is the stunning location, which makes great use of the HD format. Despite the weaknesses, specific moments show that not everyone is ready to quit. Caroline blows by a humbled Max at the Roadblock and shows that last week’s difficulties might be a rare glitch. Despite the gap, those teams roll through the leg and could be serious contenders. Their success offers hope that the competition will heat up in the upcoming weeks.